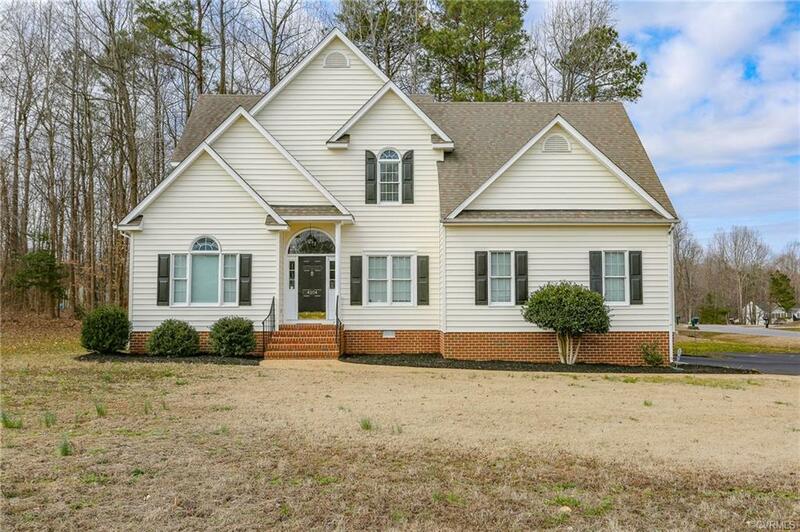 Welcome to 4204 Cedar Creek Lane in Prince George County. Sitting on a one acre corner lot, this 2,677 sqft home has been painted throughout and features 4 beds and 2.5 baths, including a first floor master suite. The downstairs master suite has new carpet, new bathroom floors, new granite countertops with his and her sinks, built in vanity and a spacious walk in closet. The newly renovated kitchen holds new flooring, granite countertops and stainless steel appliances. Downstairs also includes a half bath, spacious family room with an 18ft ceiling to the upstairs balcony, formal dining and living rooms, all with hardwood floors. Upstairs you will find another full bath and three more bedrooms, including the massive bedroom over the garage. Also upstairs is an additional 140sqft of unfinished space that could easily be converted into a fifth bedroom, playroom, home office or workout room. The attached garage will comfortably hold a large SUV and the oversized, recently paved driveway provides additional parking. Out back you will find a large, two-level deck, paver patio and storage building that will convey. Come make this move in ready house your new home, today!